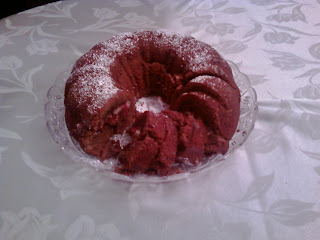 I'm always looking for interesting cake recipes - batters I can pour into one pan and just stick in the oven. As much as I love cookies, I don't love the constant in and out of cookie sheets in my tiny oven. This cake caught my eye. 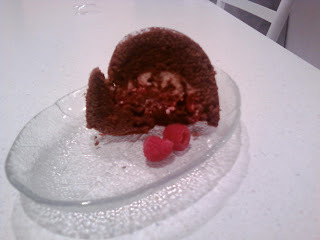 A chocolate bundt cake with a raspberry cream cheese filling. Sounds perfect. First thing I did was to make up the cream cheese filling. Cream cheese, sugar, vanilla and chocolate chips - I had to resist from eating it all right there. 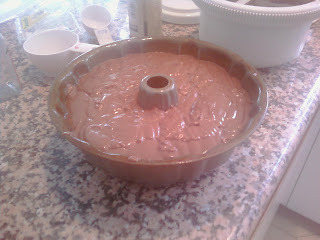 Next came the chocolate cake mix, which was thick and heavy and also passed the finger-lickin good test. I poured half the batter into the bundt pan, and then spooned the cream cheese filling on top, being careful not to let it touch the sides of the pan. I didn't end up using all the filling, since it looked like alot already. Then came the raspberries. Those also lost a few to sampling! 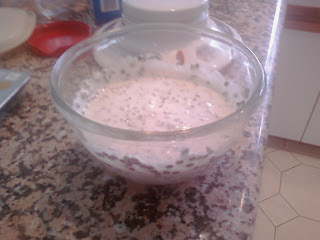 On top of that went the remaining batter. This was one heavy cake. It was a workout just getting it into the oven, but I managed. And when it came out....it was worth it. 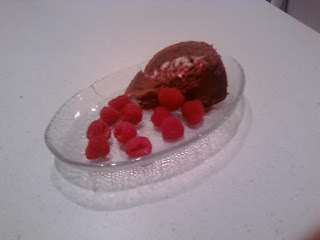 The cake was thick and dense - almost more like a brownie than a cake - and the filling was delicious. However I did regret not using all the filling, I would have enjoyed more of it. I certainly liked what there was of it. Tip of the Day: Fresh fruit usually works the best in baked goods, but frozen and thawed works when your berry of choice is out of season. Beat eggs and sugar together until pale yellow. Beat in melted butter, vanilla, milk and water. Gradually mix in flour, baking powder, cocoa and salt. Beat together cream cheese, sugar and vanilla. Stir in chocolate chips. Pour half the cake batter into a greased bundt or tube pan. Drop spoonfuls of filling over cake batter, not touching the sides. 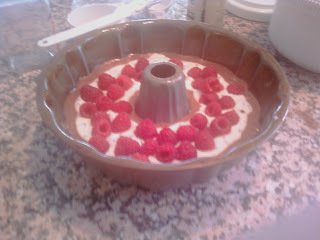 Sprinkle with raspberries. Bake at 375 for 1 hour and 15 minutes. Top with sifted powdered sugar, if desired. too bad i don't like cooked/baked fruit. HI AMY! I LOVE YOU!